Years before critically resurrecting his career as a “serious” Oscar-winning actor, Matthew McConaughey was already shrewdly poking fun at his caddish-hunk persona in Ghosts Of Girlfriends Past, an underrated romantic-comedy riff on A Christmas Carol. Skillfully guided by director Mark Waters (Mean Girls), McConaughey headlines as celebrity photographer and world-renowned ladies’ man Connor Mead, who ruins the wedding of his younger brother (Breckin Meyer) by ranting about the stultifying nature of marriage and the fantasy of true love. That instigates a visit from his dead Hugh Hefner-esque Uncle Wayne (Michael Douglas), as well as three spirits, who help him revisit his countless carnal conquests. It’s an otherworldly turn of events in which Connor must come face to face with his love-’em-and-leave-’em ways, which it turns out are the byproduct not of his fundamental superficiality but rather of his fear of getting his heart broken. The intimacy issues stems from an early moment of rejection at the hands of childhood crush Jenny (Jennifer Garner), who reappears throughout Connor’s trips back in time as the perfect match he was too clueless to recognize. 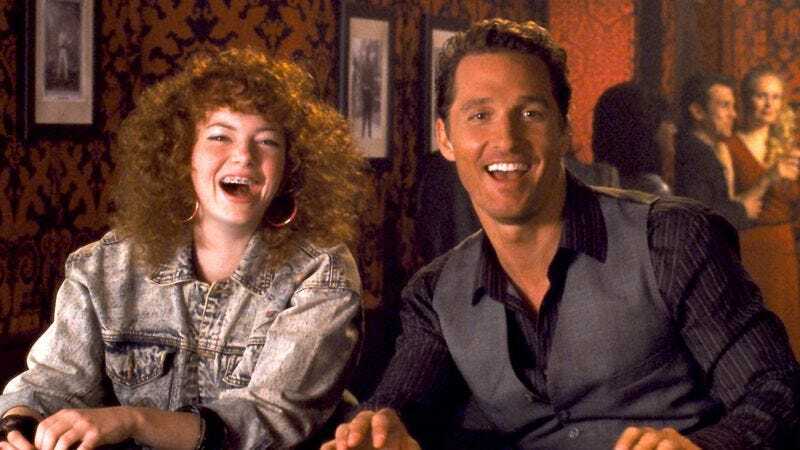 McConaughey and Garner share only mediocre chemistry, in part because the actress’ character is too often relegated to being a severe buzzkill. That shortcoming, however, is offset by the leading man’s deft caricature of his many shirtless-and-smiling stud roles; there’s an unabashed swagger to the performance, suitable for a character capable of literally charming the pants off of swooning beauties. Whether hitting on his brother’s future mother-in-law or fleeing a downpour of his used condoms, McConaughey has rarely been this entertainingly cocky (pun intended). Moreover, he’s ably supported by both a hilarious Douglas, playing a wannabe-mythic one-night-stand guru, and an equally amusing Emma Stone, as the dorky ’80s ghost of Connor’s teenage virginity-taker. Together, the actors turn Ghosts Of Girlfriends Past into a prickly saga of a lothario learning to be a man—one lively enough to overcome even its inevitable condemnation of the very bad-boy behavior that generates most of its laughs. Availability: Ghosts Of Girlfriends Past is available on DVD, which can be obtained from Netflix, and to rent or purchase through the major digital services.